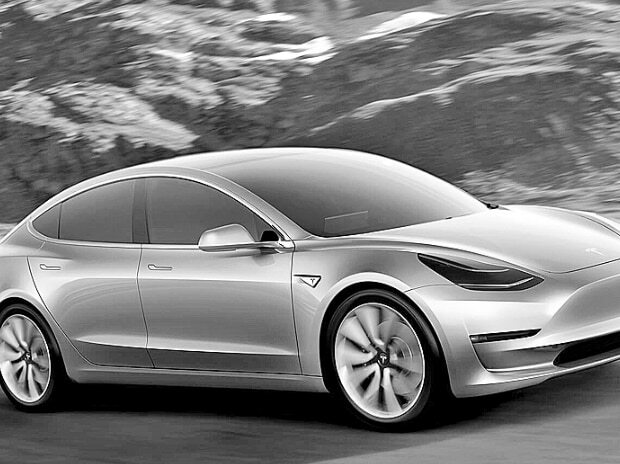 It’s finally here: The Model 3, Tesla’s $35,000 electric game changer. A single black Model 3 rolled off the production line on Friday with a serial number all its own, kicking off a company-defining six months. The car will belong to Elon Musk, Tesla’s CEO and co-founder, who shared images of it on Twitter over the weekend. Tesla has already taken in roughly half a billion dollars in Model 3 deposits, at $1,000 apiece, and its proposed ramp-up schedule would have it rivaling well-established US market peers like BMW and Mercedes by year’s end. The only thing standing between Tesla and being the world’s first mass-market electric carmaker is proving it can build, deliver, and service enormous numbers of these vehicles—without sacrificing quality. One down, millions more to go. The production acceleration will be slow at first. Tesla plans to hand over the keys to 30 cars at a launch celebration on July 28. It then envisions building 100 cars—less than three a day—for the month of August, according to a series of Twitter posts by Musk last week. September will bring another 1,500 cars, and the ramp will build to a rate of 20,000 cars a month by December, Musk said. It’s an aggressive schedule that will more than double Tesla’s total production rate in six months, and then quintuple it by the end of next year. If Tesla achieves all of Musk’s targets, it will build more battery-powered cars next year than all of the world’s automakers combined in 2016. US sales under Musk’s 2018 targets would significantly outpace the BMW 3 Series and the Mercedes C-Class, the best-selling small luxury cars in the country. Tesla, by tradition, delivers the first new car off the line to the first customer to pay full price once the car officially goes on sale. Musk’s collection includes the first Tesla Roadster and the first Model X—but not the first Model S. That trophy belongs to Tesla board of directors member Steve Jurvetson, who told the Chicago Tribune in 2010 that he scored the first of Tesla’s flagship sedans by writing out a check just before a board meeting and tossing it across the table. The right to the first Model 3 was won by board member Ira Ehrenpreis, who then gifted it to Musk for his 46th birthday, on June 28. Key handoffs will begin in California and move east, focusing first on employees of Tesla and Musk’s SpaceX rocket company, then on other US reservation holders who stood in line before the car’s unveiling some 15 months ago. People who place new orders today won’t receive their cars until the middle of next year, according to Tesla’s website. The first drive of a Model 3 test car in March. The carmaker will be taking things slowly at first, as it looks to avoid the disastrous roll-out of the Model X, which was marred by mis-aligned body panels, software glitches, problems with the falcon wing doors and spaceship-like seats, and a fleet-wide recall tied to a seatbelt issue. (These faults have largely been addressed, and the Model X is now the fourth best-selling luxury SUV in the US). There’s tremendous demand for the Model 3 among Tesla’s 30,000 employees—most of whom are unable to afford the pricier Model S and Model X. Musk is putting that interest to use, releasing the first several thousand Model 3s to employee reservation holders. Any problems identified during the early rollout can be quickly addressed at the factory. Features are being stripped down. Over the past few months, Musk has consistently tried to downplay expectations for new features. The car that rolled off the production line on Friday shouldn’t stray far from the original prototype unveiled in March 2016. There will only be one display—the car’s 15-inch touchscreen—with no additional gauges or heads-up-display projected at the windshield. Additionally, the dual-motor all-wheel drive and high performance versions of the Model 3 will be delayed for six to nine months to keep initial production as simple as possible. New Aero wheels are coming. Tesla was granted a patent on June 6 for this new aerodynamic wheel face, one of two designs that the company has deployed on the test cars seen driving around the country in recent months. (The other design is shown in the production car above). Tesla briefly offered Aero wheels for the Model S in 2013, but they were considered unattractive by many consumers and were quickly pulled from the market. At the time, Tesla said they could boost the car's range by 3 to 4 per cent.